I tried making it through the movie Napoleon Dynamite a couple of times. I just never quite got it, the humor and the appeal of this indie flick. But in missing the point of ND, I clearly also missed something of a culinary resurgence that the movie seems to have helped launch: “tots.” The little nuggets of potato goodness were, apparently, a favorite food group in the movie. Once again, NPR set me up with the information I needed. I not only learned, driving around a few weeks ago, of the tots’ role in the movie. I learned a little food history (the nuggets of compressed potato bits was devised at Ore-Ida using trim from their French fry production) and that tater tots were making their way into the fine dining circuit. You can catch a clip from the film here, linked with a piece a couple years ago also on NPR about the Napoleon Dynamite Festival in Preston, Idaho (which includes a tater tot eating contest, natch). This recent story particularly caught my attention because not a week earlier I’d been nibbling on a tater tot for the first time in many years. Not a Tater Tot® out of an Ore-Ida bag, instead a housemade version at Ten 01 in Portland. It was happy hour and I’d ordered their tots, embellished with bacon and shallot, to accompany my Alaska cocktail (gin with yellow chartreuse and a couple dashes of Regan’s Orange Bitters ; wonderful). 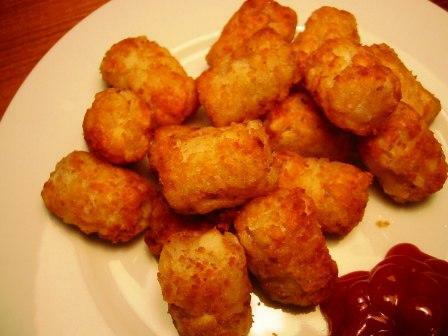 Unapologetically served with classic Heinz ketchup, those tots were outstanding. I broke down and bought a bag of Ore-Ida tots last night and served them, a bit sheepishly, alongside the lamb stew and asparagus. It’s usually all-from-scratch around here. My husband didn’t miss a beat, “I’ve always liked tater tots,” he tells me. Guess I’ll have to pick up a bag now and then. They honestly are pretty tasty, especially with a few extra minutes in the oven to get perfectly brown-crisp on the outside, still tender on the inside. I suppose I could try to come up with my own homemade version. But sometimes, it’s good to stick with a classic.